At midnight, one year fluidly poured into another just like that first and second and last drop of champagne. Before the whisperings — the chimera in my brain — wander too far to recover, I’ll participate in the Ten Things of Thankful. I’m not very good at this gratitude thing; it feels all scratchy like a wooly sweater that I can’t wait to take off. HOWEVER, I’m willing to step out of my comfort zone for just a second – read quick before it’s gone forever, ‘cos I’m way better at whining about ten things than anything else. 6…winning at Scrabble not one, but two times! This entry was posted in All Posts, My Enchanted Life, Princess Rosebud and tagged being grateful, gratitude, Ten Things of Thankful, Thankfulness, TTOT by Enchanted Seashells by Princess Rosebud. Bookmark the permalink. A beautiful list – I’m glad your son is okay! Wishing you a wonderful, health New Year! Thank you and much happiness and good health to you too! Not TMI, but heavens, it sounds terrifying! Glad he’s OK. Living near the ocean would be wonderful. We’re a full 10 hours from the nearest shore, so we don’t see it often. Glad your husband could be home to celebrate the holidays with you. I admire the way gratitude flows from you guys, maybe you have the secret to success? Thanks for commenting for sure, and I’ll try to join you, if not, I’ll def get inspiration from reading you! Oh my gosh – that’s so scary about your son! I’m glad he’s okay and doesn’t need the bag (not TMI, I’d be thankful for that all over the place)! Happy 2015 – here’s to winning at Scrabble and to animals and a great guy! Here, here! To all of the above, for sure! Best wishes to you for a happy and healthy 2015! “At midnight, one year fluidly poured into another just like that first and second and last drop of champagne.” – a beautiful sentence! Glad your son is OK – I don’t think there’s any such thing as TMI if it’s something you want to share. I am always happy to celebrate a win at Scrabble (or anything similar). Hooray for you! I think expressing gratitude is an uncomfortable thing for many people. Doing it is a great exercise, though, and I know doing it and linking up with the TToT gang has seen me through a pretty rough stretch of life. Have a happy new year and a great week ahead! I’ve definitely made some new friends thanks to Ms Lizzi. A long time ago I got a degree in creative writing and it seeps out of me every now and again, thanks for liking that sentence! I am resolving to be more thankful! Wow …not tmi ..think it shows the seriousness of what you guys are dealing with. It was the shock of our life to hear the doc explain what he found when he opened him up. Thank you for commenting and happy new year! His favourite toy was a hammer? Yes, as strange as that might seem, that yellow hammer was his constant companion for a while, we still have it, and seeing it still lights up his face to this day, no one can explain it! 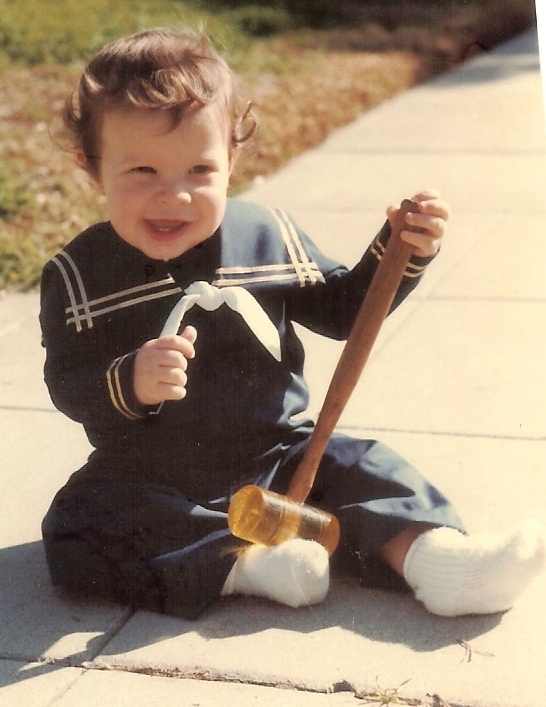 Doncha just love the sailor suit-well before there was a tugboat man in the picture? He’s so cute. And no, there’s no accounting for what appeals to kids. That’s real power, isn’t it? Sure is! She abuses it. Ooooh I’m excited to see you joining in, even if it’s just for a brief moment. I love your list – you have a lot to be thankful for, and we have a lot in common, as we know. I hope to see you again here this year! I’ll try…if I could be anonymous, I’d have more to say! No TMI for me. Looks like a great list–it just is–true to (your) life. Thank you! And nice to meet you, too! Your son is adorable! Happy New Year! I can’t disagree with you about that 🙂 and thank you! Happy 2015 to you, too. Much health and happiness. Holy moly! How many feet of intestine can you live without and not have to have an ostomy bag?! So glad it’s more than three feet! There’s no such thing as TMI with me; I wrote about my colonoscopy AND my hemorrhoidectomy! My son carried around a screwdriver set for months when he was three and I was pregnant with my daughter. It was a half moon shape, and if you pushed on one side of the top of it, it would swing around and expose screwdriver heads that were stored inside the half moon. It was bright orange and my son had no idea it had screwdriver heads inside until he had it in his hand at one of my ob/gyn appointments, and my doctor took it from him to admire it and flipped it open…. Oh, I’ve so got to read about your experiences! Not that I’m happy about them, but I’m very interested in this topic. He actually had 2 feet of ascending small intestine removed and about 8 inches of ascending colon removed and that’s better than descending if you get the whole picture of it. I just combined the two…I think you can get away with almost 3 feet of resection IF it’s the right location. He also had his appendix removed and lots of other little parts that were damaged. I love that your son carried around a screwdriver set-what is it with boys? They are so adorable!